About six years ago, Jillian Klaucke joined a group of female physicians in Baltimore who met for dinner once a month. It’s a routine she’s kept in her life through several moves, and one she brought with her when she came back to her hometown of Sandpoint. Members of the Third Thursday Women’s Meetup meet at Matchwood Brewing Co. Courtesy photo. Klaucke said she invited several female friends working within the medical profession to meet, and while it was fun, she realized she knew more women in Sandpoint outside her professional realm that might benefit from a monthly meetup. “Maybe (there were) people from the physicians’ group who wanted to learn how to mountain bike, or somebody wanted a connection for a babysitter,” Klaucke said. 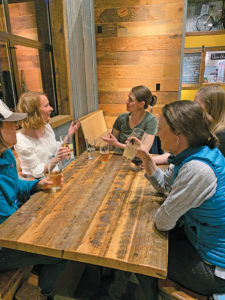 So she launched the Third Thursday Women’s Meetup at Matchwood Brewing Company, where women from all backgrounds are invited to enjoy an evening of informal networking. “I felt like I knew a lot of really cool women who needed to meet,” Klaucke said. Malina Lieven, who moved to Sandpoint a year and a half ago, said working from home and caring for her young children has made it difficult to meet people outside of her neighborhood. She said attending the first couple women’s gatherings has been a big help with making connections. Klaucke said the group isn’t opposed to men joining in, but the monthly meetup is more based on the concept of creating bonds between female community members. While that space is a brewery, Matchwood also offers non-alcoholic drinks and food, so Klaucke said sober members of the community should know they’re welcome. She also said that while Matchwood is kid-friendly, Third Thursday gatherings are meant to be kid-free if possible. Klaucke and Lieven agreed that the monthly gatherings are meant to be low-stress, low-commitment and simply an option for finding connections in an informal setting. “You’re bound to find a friend,” Lieven said. The next Third Thursday Women’s Meetup is April 18 at 7:45 p.m. at Matchwood Brewing. Those who want to learn more or confirm they’re going to the event can find “Third Thursday Women’s Meet Up” on Facebook (hosted by Malina Lieven), or simply show up.